'The Nutcracker and I'. Photo by Prudence Upton. 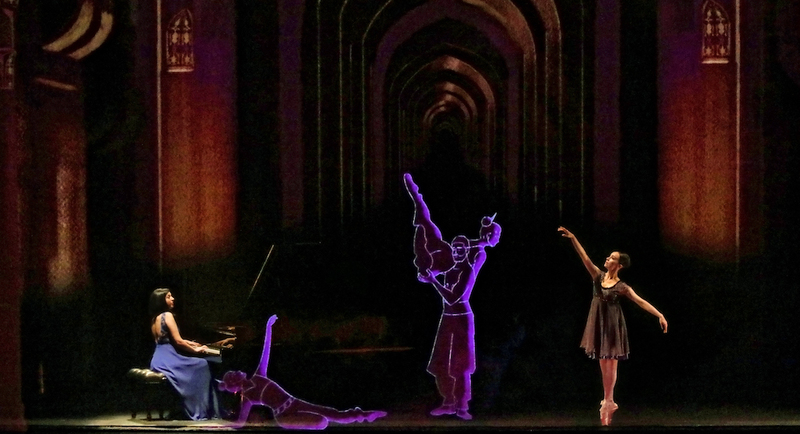 In The Nutcracker and I, part of the Sydney Festival, Romanian pianist Alexandra Dariescu reimagines Tchaikovsky’s Christmas story. Yes, we have the traditional snow flurries, the amazing growing Christmas tree that just gets bigger and bigger, the battle with the Mouse King, the Sugar Plum Fairy, and the Kingdom of Sweets. But it is also autobiographical. The show gently starts with the projections of an animated little girl walking on stage, sitting at the (real) piano and starting to play. With swirling snow, she becomes Dariescu, reimagined as Clara, the girl who dreamt of becoming a concert pianist. 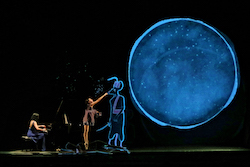 Projected onto the gauze screen and bringing the story to life are exquisite digital animations, all hand drawn and created in advance by Yeast Culture, created using more than 35,000 hand-drawn images. 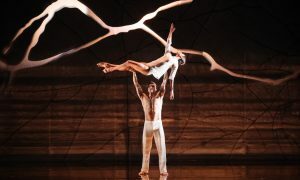 They follow the music and engage live with Dariescu and ballerina Désirée Ballantyne as they “dance” across the screen. ‘The Nutcracker and I’. Photo by Prudence Upton. The first part of the show (with Dariescu playing) is all animation, taking us through to the visit by family friends, the Christmas party (reduced to a small family of visiting friends) and the damaging of the Nutcracker doll. There is no Drosselmeyer. Once Clara sobs herself to sleep, she transforms into Ballantyne, and the live dancing begins. Ballantyne wears a sleeveless, grey and silver, flowing shift dress that swirls wonderfully. So we see in animation the Nutcracker doll transform into the handsome prince, who bows rather stiffly at first but is really a premier danseur with wonderful jumps and turns. Choreographically, Ballantyne as Clara interacts a great deal with the various animated characters, at times copying their movements, or in dialogue with them. It is all based on the “traditional” Petipa/Ivanov choreography. 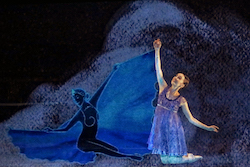 But there is no real partnering or high lifts or supported turns, for example, with the grande pas de deux; although, yes, they are included in the animation. The projected set designs for the various locales are magnificent. The Sugar Plum Fairy is wonderful, fluttering and darting magically with huge butterfly wings. The Chinese dance, based on tea (the dancers appear out of a tea pot and drink small cups of tea), with hanging red lanterns, is the pointy-fingered bouncing, bobbing version with deep pliés. The Turkish dance is slinky and sultry, with at first two harem dancers with long scarves that curve and swish and then a male and female pas de deux with high lifts. The Russian dance (turquoise set, sort of art nouveau design) is three fur-hatted, very energetic gentlemen doing an exuberant trepak. The mirlitons dance, in some ways, is Loie Fuller-like with dragonfly-like swirling “wings”, which becomes full of swirling clouds. It all ends with a return to the young animated Clara, and then we see a concert hall which eventually leads to the spotlight back on Dariescu – cue Waltz of the Flowers. It is also great fun to see the animated curtain calls at the end. The Nutcracker and I is an enchanting family show blending animation and live performance (piano and ballet), and the packed audience (which included ex-Prime Ministers) loved it. By Lynne Lancaster of Dance Informa. 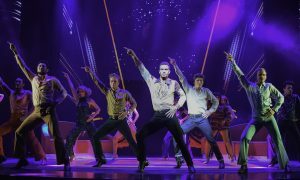 ‘Saturday Night Fever’: Dancing the night away!